Chewy (not-cakey!) 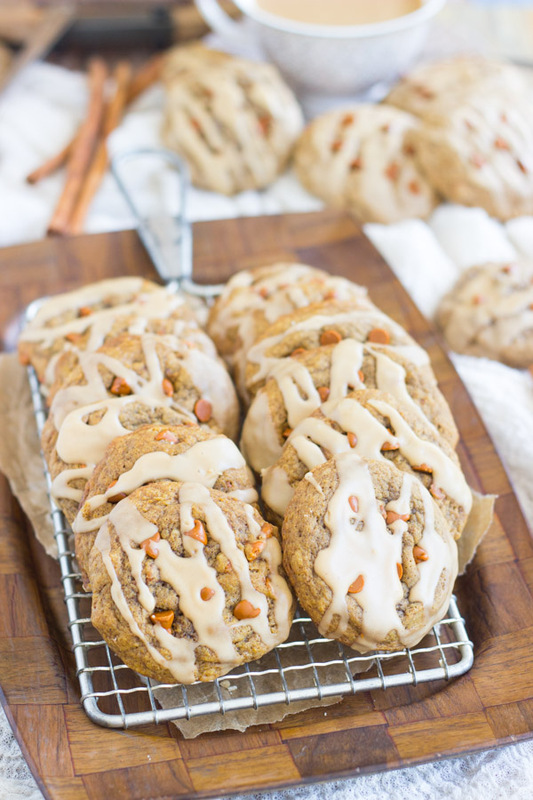 pumpkin cookies, loaded with spice, flavored with coffee, and drizzled with a coffee glaze! 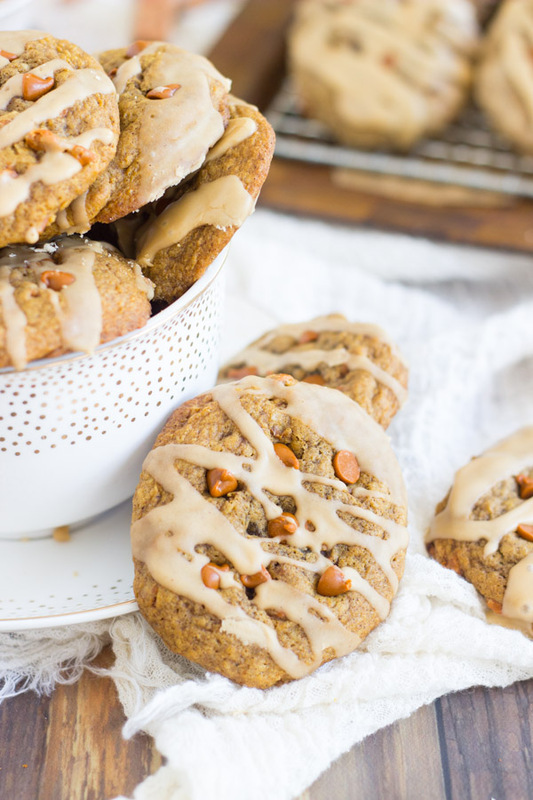 These Pumpkin Spice Latte Cookies are your favorite fall beverage in cookie form. 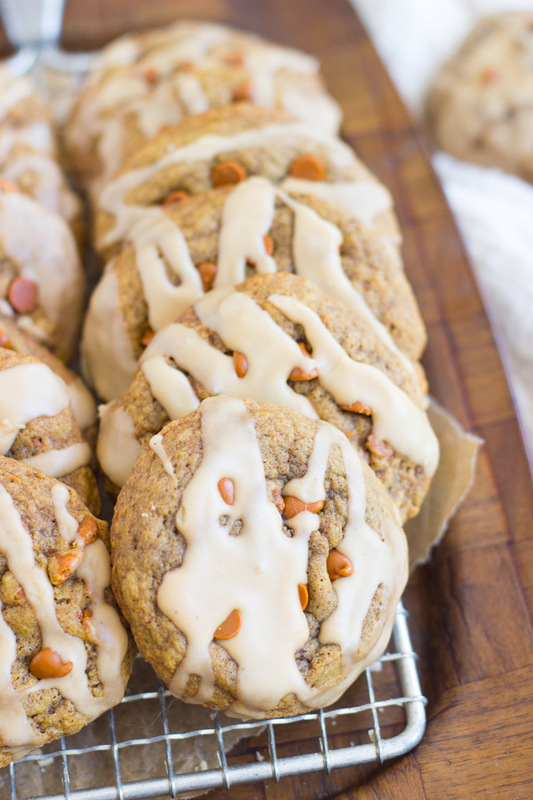 These Pumpkin Spice Latte Cookies are fantastic, and I’m so excited to make them every fall! It’s that time of year where the masses obsess over Starbucks PSLs. I’m not in that camp of people though. I love coffee, and I love pumpkin, and I love them together, but that beverage doesn’t do it for me. 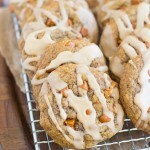 These Pumpkin Spice Latte Cookies, however, do. They do it for me. And they will do it for you too, if you like pumpkin and you like coffee. And if you like Starbucks PSLs. Even if you don’t like Starbucks PSLs, like me, you’re still likely to enjoy these Pumpkin Spice Latte Cookies. If you’re like my brother and SIL though, who hate coffee, than I guess you could skip these? I don’t understand people that don’t drink coffee!! Help me understand. I made several batches of these Pumpkin Spice Latte Cookies, and was trying to decide which version I liked best. I passed them around to friends for taste-testing, and the group was split, but I was the lone dissent. My personal favorite version was ultra-chewy, in every possible way, but the majority of people liked these cookies with crispy edges and chewy centers. So that’s what these are: they have crispy edges and chewy middles! They’re soft, minimally cakey, and overall, very chewy. 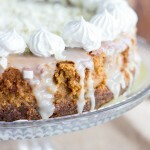 It seems like everything pumpkin touches becomes cakey. 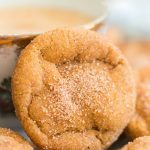 Not these Pumpkin Spice Latte Cookies – they still have a substantial amount of pumpkin, and are strong on pumpkin flavor, but they do not turn out cakey. See? You can see it in the pics. 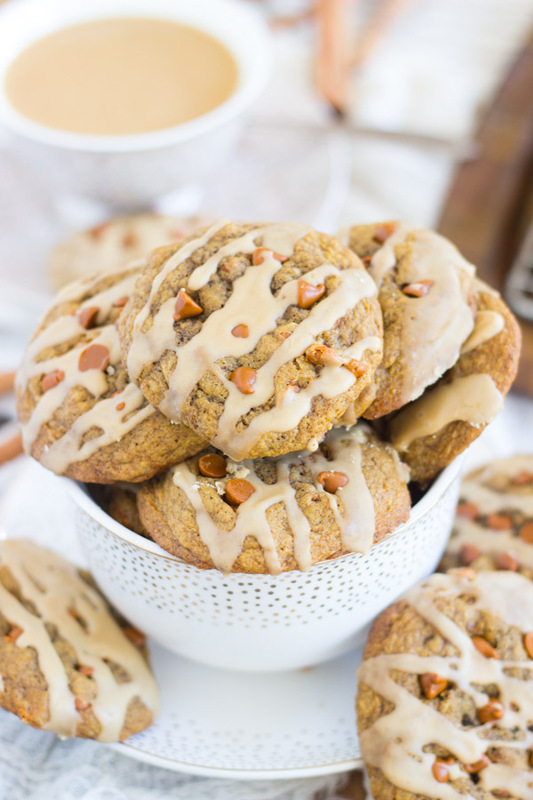 These Pumpkin Spice Latte Cookies are loaded with spice too. I love a pumpkin cookie that’s pretty heavy and intense with pumpkin pie spice, cinnamon, ginger, and clove. If you’re going to make a pumpkin cookie, what’s the point if it isn’t heavy-handed with spice? We want to represent this cookie’s namesake too, so to make it more PSL-ish, it’s heavy on warm, fall spices. Cinnamon chips are a big bonus in these cookies. They add to the spice, and they are also great for texture. I love cinnamon chips for fall baking, and I usually find them at Walmart pretty easily this time of year. Lastly, there’s coffee granules right in the cookie dough for latte oomph, and the latte flavor is accentuated with a quick and simple coffee glaze drizzled on top. I don’t have an espresso machine (unfortunately!!) but you could just mix powdered sugar with a shot of espresso, or with strong-brewed coffee for the glaze, if you’d like. It’s flexible. I love Starbucks Via instant coffee, and so I just stuck with instant coffee granules. You’ve got options when it comes to the glaze. 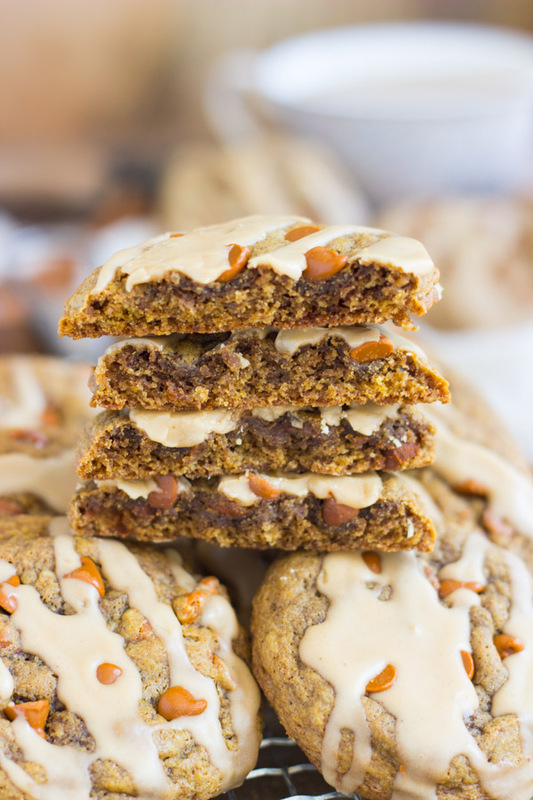 These Pumpkin Spice Latte Cookies cookies have all the main flavors that you look for in pumpkin spice lattes, and they are all prominent and balanced. You definitely get pumpkin, you definitely get spice, and you can’t miss the latte component either. I had so many batches of these Pumpkin Spice Latte Cookies from playing around with ingredients and spices that I stuck some in the freezer about a month ago. I got them out yesterday to defrost, and nearly two dozen were gone by this morning just between my S.O. and I. I’m seriously not exaggerating. That should be a promising indicator for this recipe. 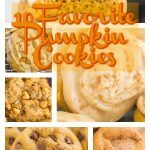 If you love soft & chewy pumpkin cookies, check out these these Pumpkin Snickerdoodles and these Chewy Pumpkin Chocolate Chip Cookies! If you’re interested in a cakier pumpkin cookie, check out these Pumpkin Cookies with Brown Butter Icing, these Pumpkin Cookies with Cream Cheese Frosting, or these Pumpkin Cookies with Maple Frosting. 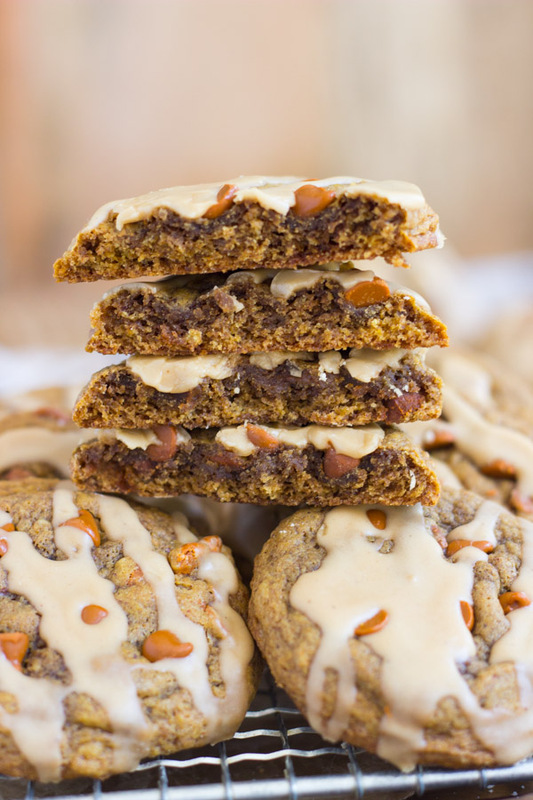 Oh, geez, and White Chocolate Cranberry Pecan Pumpkin Cookies! Chewy (not-cakey!) 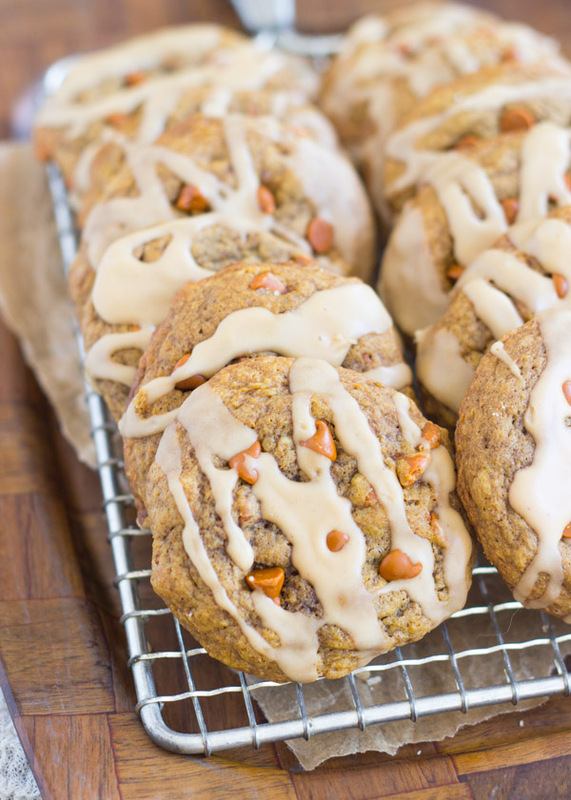 pumpkin cookies, loaded with spice, flavored with coffee, and drizzled with a coffee glaze! 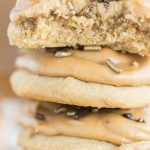 Your absolute favorite fall beverage in cookie form! 1/2 c. sugar optional sugar coating - SEE NOTES. In a large bowl, whisk together butter, brown sugar, egg yolk, vanilla, pumpkin, and instant coffee granules. In a medium bowl, whisk together salt, cinnamon, pumpkin pie spice, ginger, clove, baking soda, and flour. Add the dry ingredients to the wet ingredients, and stir until just combined. Chill cookie dough in the refrigerator for at least 2-3 hours, until firm, and preferably overnight. Do not skip this. Line cookie sheets with parchment paper or silicone baking mats. Scoop the dough by tablespoonfuls, and shape into balls. To make the cookies fatter and taller, rather than thin and flat, shape the balls into more of a tall cylindrical shape. Bake at 350 degrees for 10-12 minutes, or until edges are golden, and the centers appear set. If you tap the top of the cookie, it should only slightly depress. You want to underbake these slightly so that they remain chewy in the center. Remove from heat, and allow to cool on cookie sheets for 2-3 minutes before removing to wire racks to cool completely. They will continue to cook a bit on the sheets. If desired, you can press additional cinnamon chips into the tops of the cookies while they're still warm to give them a nice bakery appearance. Once cool, drizzle with coffee glaze. In a medium bowl, combine coffee granules and hot water. Add 2 c. powdered sugar, whisking until smooth. If needed, add more water or powdered sugar to achieve desired consistency. It shouldn't be runny, but you should be able to drizzle it with a spoon. Drizzle glaze over cooled cookies, and allow to set for 15-20 minutes. DEVOUR. I made several batches of these cookies, and I accidentally rolled the dough balls into granulated sugar for one of the batches (I had ginger cookies on the brain). They're not supposed to have that, but it was very well-liked by my taste-testers, and if you prefer a cookie with a little crunchy sugar coating, then it's optional to roll the dough balls in sugar before baking. Those cookies are not pictured though. You can sub 1 shot espresso for the coffee granules and hot water in the glaze. Just add powdered sugar straight to espresso til you reach the desired consistency. Please read the notes before making these cookies!! Since I made several different batches, and people had different preferences, there’s small options for switching them up. I provided the recipe that was most popular with taste-testers though, and ALL versions were delicious, honestly, so you can’t go wrong. These PSL cookies look so delicious tasty! I love the idea of pumpkin and espresso and yet i’ve never had a pumpkin spice latte- isn’t that wild? That is wild, girl! You gotta try one! I’m not really into PSLs for drinking, but their flavors rolled into a cookie? YES, please. That coffee glaze is brilliant! I’m not either, to tell you the truth. I love the idea of a PSL, but I don’t like the beverage. The cookies are divine though! Made these tonight for a couple cookie trays for Thanksgiving. Good thing i made a double batch! I was worried when i tasted the dough but they baked up great and the glaze is a nice addition. Very addicting! I froze some for a dinner in a couple weeks. Thanks for the recipe. Yes! 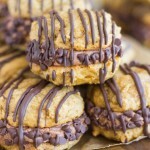 It only makes about 2 dozen cookies – great idea to double the recipe! I often do too. I’m so glad they turned out well for you! Anything you would change next time, or any other feedback that might help readers? Thanks for your kind comment, and enjoy the holidays! !